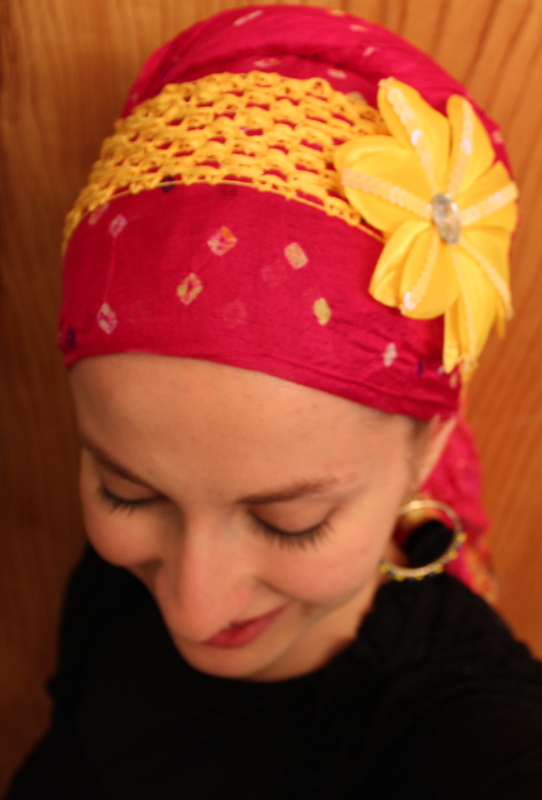 I try to convey to women that one should continuously strive to love covering her hair (as with all mitzvot), which means coming to understand it deeply, emotionally, philosophically, logically, and then learning how to put all that knowledge into her daily practice. On the same note, I would never advise a quiet, subdued woman begin by wearing outlandish wraps, same as I would not advise an extroverted, bubbly woman start covering by wearing something neutral. That being said, we are so much more than the labels that we give ourselves, and I ALWAYS encourage women to try something new and not get stuck in a hair wrapping rut. I have often surprised myself by loving colours and styles that I had previously deemed “not me”. 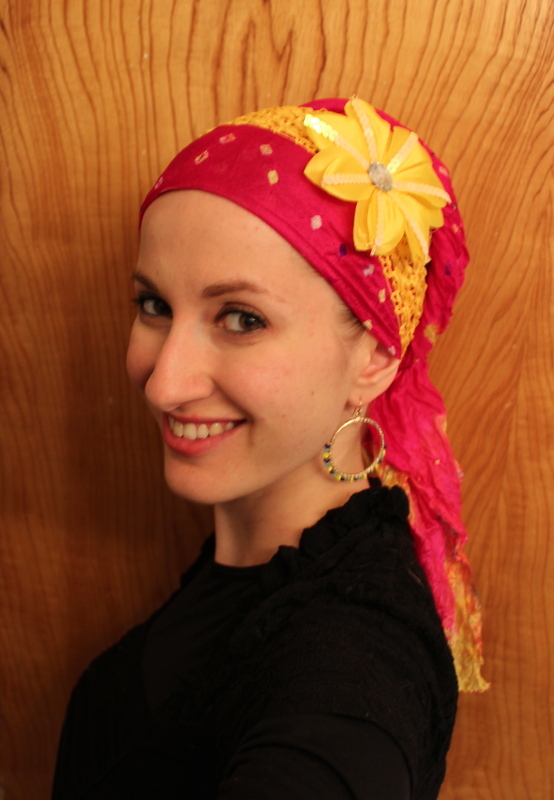 Hence the story behind this beautiful wrap; Hot pink, bright green and a huge yellow flower? So not “me”. But I tried it, and ended up loving it! This is really nice. It brings out the colour of your eyes. I think you are right in that women need to find courage to try new things. 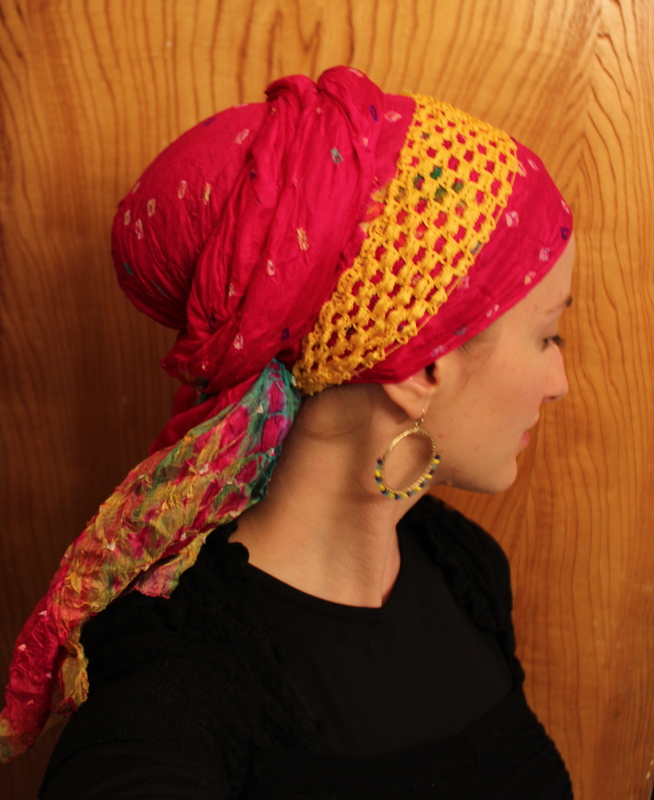 Even for a religous woman, who is already familiar with the meaning attached to a headscarf, covering her hair might be a big step. 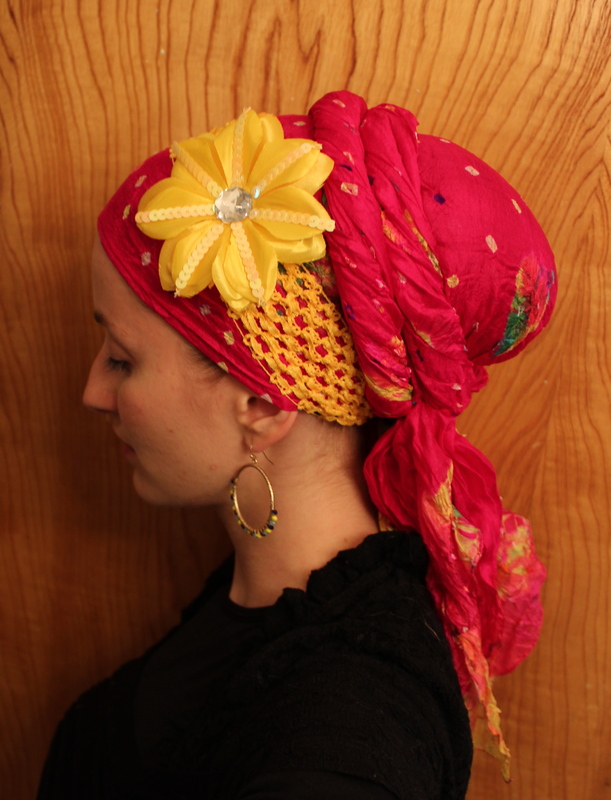 I feel this blog is a safe space for any woman interested in headcoverings, regardless of her personal reasons for covering. Thank you and thanks to all the other women who read and comment. Just lovely! You are so beautiful and bright. Like you, I am a Canadian now living in Chicago. I would love to teach you how to make jewelry. If you are interested, contact me off line. Your latest Batsheva is my beloved daughter! 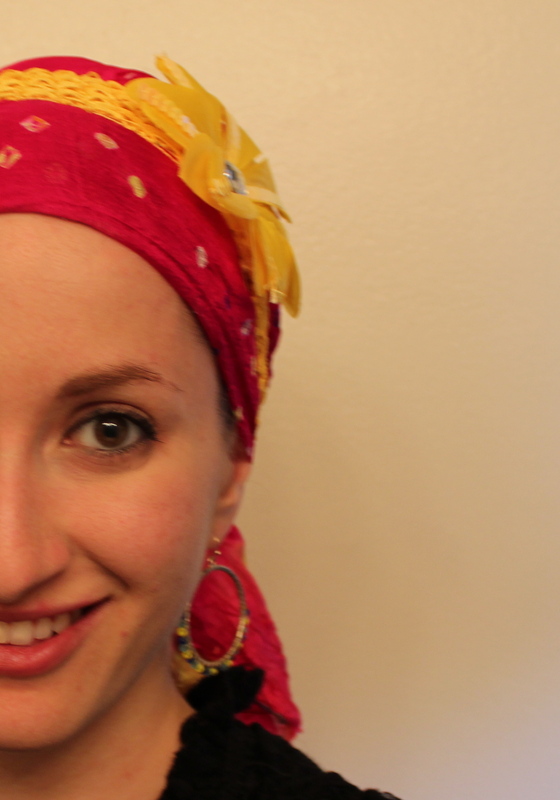 I am not a woman that covers my hair, but I love your posts and vids. 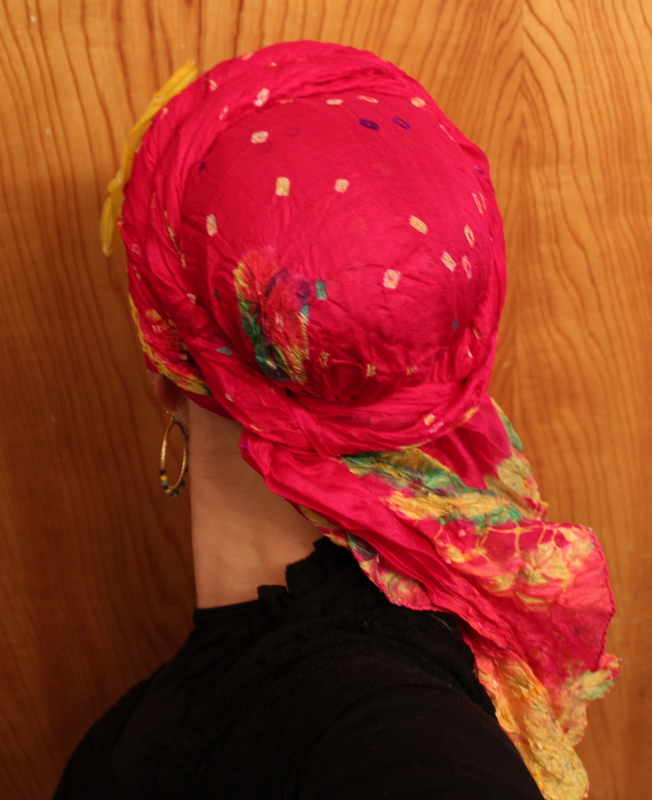 If I ever needed to cover my head for any reason, I’d certainly whip through one of your posts or vids so that I would look spectacular! Thanks! Great wrap – thank you so much for the colour and happiness it brought to my day! very lovely, but I am not that brave yet. the stretchy yellow band I see I was thinking about getting one do you feel that it stays on tightly? Is this a sari scarf? I adore the colour! Where did you get it from? Thanks for your help and have a great shabbat!